Say it with pizza or not at all! They say that human taste evolves over the years. When hearing that sentence, I usually think of more sophisticated things than pizza. I never really liked pizza. I found it a bit boring and when going to Italian restaurants I usually chose some fancy pasta recipes. But 2016 was the year when my taste buds suddenly changed their sense of taste and I actually started to like pizza. So what did the switch result from? Difficult to say… but…one of my colleagues seems to be a little pizza addict. 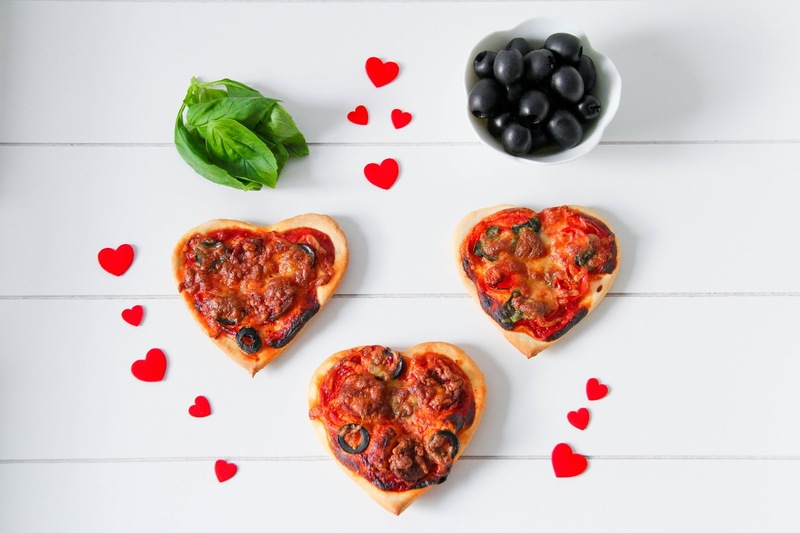 Over the year, she was regularly talking about that famous place in the eastern part of Luxembourg where she would enjoy the best pizza of the Grand Duchy. When hearing her talk about pizza all the time, I thought come on, give it a try. And bam! I liked it. So I went from 1 pizza when having no choice every couple of years, to 3-4 pizzas in only one. Obviously now I realized what I have missed out on all these years. So I faced the challenge to develop my own recipe and I have to admit that I'm very happy about the result. I was looking for a spicy and a herbal juicy version, that's why I came up with the two recipes hereunder. 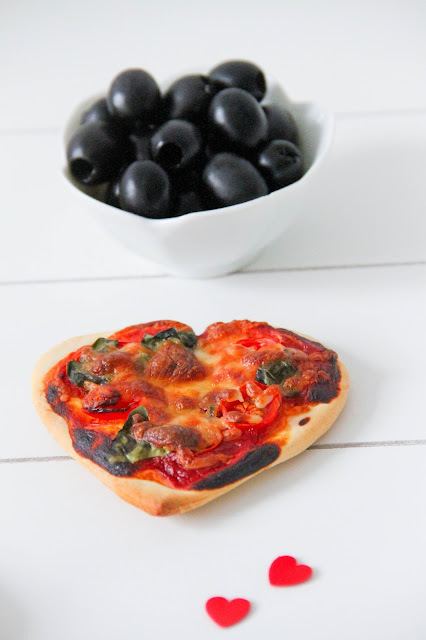 As you may see, for the upcoming love birds festivities I made little pizza hearts. 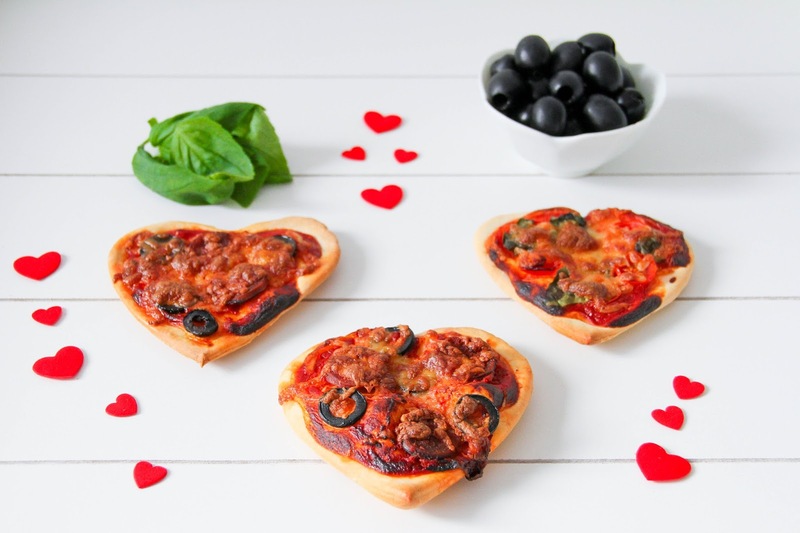 Well yes… say it with pizza! I'm not much of a fan of the commercial offers in stores for Valentine's day, but preparing some cheesy (ha! yes loads of cheese please!) 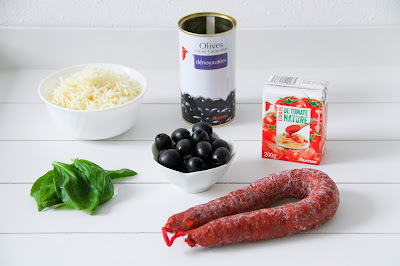 treats for diner is totally OK.
All the ingredients for the recipe can be found on the Auchan Drive website. Pour the lukewarm water into a small glass. Add the yeast and stir vigorously until you can no longer discern the yeast. In the bowl of a stand mixer with the dough hook attached, mix the flour, salt, olive oil, yeast water as well as the two tbsp cold water on low. Turn the speed up to med-low and mix for about 5 minutes until the dough forms into a ball. Once done, knead the dough firmly with your hands for ten seconds, then wrap it into a damp towel and put it in a warm ware to let it double in size about one hour. Unroll pizza dough and cut out heart shapes until the dough is used up. You can also use a heart-shaped pancake ring. 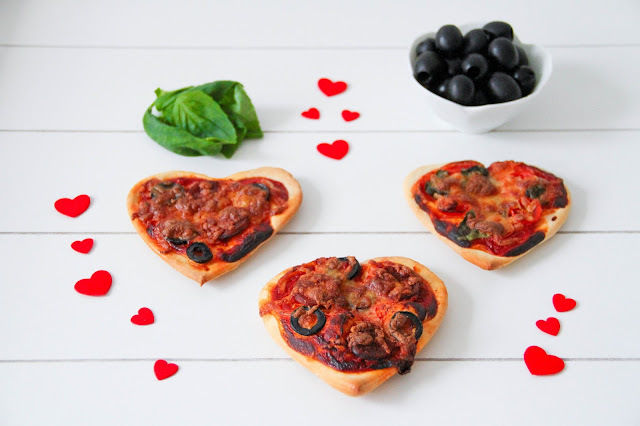 Then place the dough hearts on a baking sheet. Fill center with tomato sauce. Top with chorizo & chopped olives or halved cherry tomatoes and chopped basil. Finally add the grated mozzarella on all of the pizzas. Bake for around 15 minutes until the crust gets golden brown.